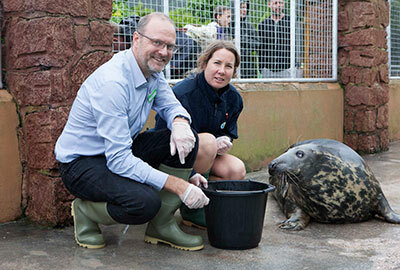 The Cornish Seal Sanctuary celebrated their Diamond Anniversary this summer! In July 1988 Ken Jones retires. 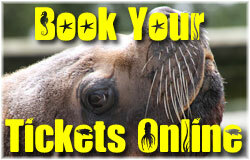 He sells the Cornish Seal Sanctuary to his friend Mike Thomas and a Board of Investors. Mike was working at the Seal Sanctuary as a Consultant for some time Ken continued to live close by and would often pop in to help out. In 1990 Macaroni Penguins arrived at the Sanctuary, after a year they had their own purpose-built pool, now used by the resident Common Seals. Here is a short video of the Penguins being moved by Courtney and Malcolm, to the new enclosure. 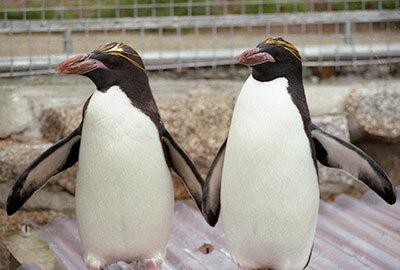 The Penguins stayed for a few years until they were moved to Edinburgh Zoo. In early 1990s Purbeck the baby seal should be splashing around in the Arctic - but a wrong turn found him 2,000 miles away in Dorset. The harp seal had already swum 1,500 miles from summer feeding grounds off Russia towards northern Canada when he veered left instead of right and began heading south. First stop was Poole harbour where he was rescued barely alive after fisherman spotted him lying on a pontoon. Click here to read more the full newspaper article. In 1992 Pepper and Rocky, Californian Sea Lions, got to meet each other, here is a short video story of how they met with rare footage of Pepper in Cape Cod Aquarium. Click here to read their story. Pepper was 13 years old when she came to England. Website Editor Note: We found a newspaper article in the New York Times from 1981 about the Cape Cod Aquarium. With Pepper came Ursa, her granddaughter, who was 6 months old. Ursa stayed at the Seal Sanctuary for a few years in the convalescent pool, she was very mischievous, a real show off and would wind all the grey seals up by doing dolphin impressions over them in the pool. She was moved to Chessington and then in February 2007 to Mundomar Marine in Benidorm. 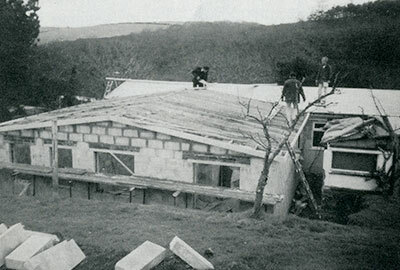 In 1993 the Seal Sanctuary had its first extension to the hospital. Work had cost around £50,000. Click here to read a pdf version of the newsletters dated Winter/Spring 1993 and Summer 1993. In 1993 the Sanctuary was sold to Vardon, who later became Merlin Entertainments, for £1.8m. Ken expressed a desire to purchase the Sanctuary back but wasn´t given enough notice. 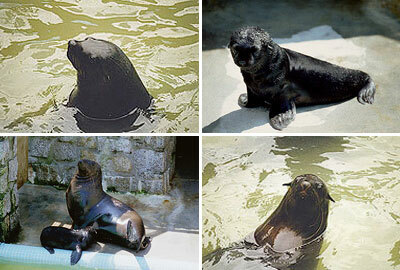 In 1999 the Sanctuary had four Fur Seal visitors. They were Cape Fur Seals, three from Coombe Martin Wildlife Park in North Devon (Andy, Mandy, and Princess), and as the adult female turned out to be pregnant, one born at the Sanctuary (Chaff). 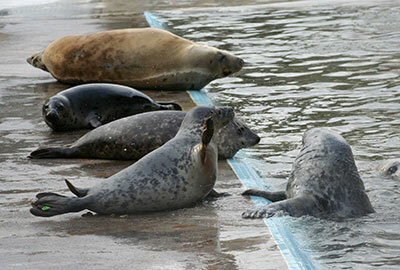 These were visiting on a temporary basis at the Sanctuary, whilst their pool was being refurbished. 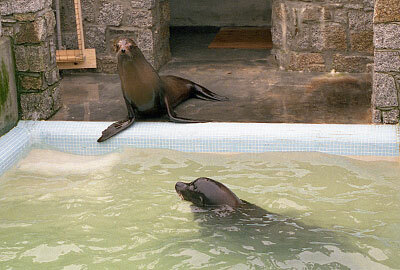 In 2001 a new Sea Lion Cove was built, this enclosure was home to the much loved Patagonian Sea Lions, Carus and Dipsy. Dipsy passed away in 2006 and Carus passed away in 2008. Over the years Sea Lion Cove has been home to Carus (photo below), Dipsy & Boadicea and the current residents are Diego & Noito. 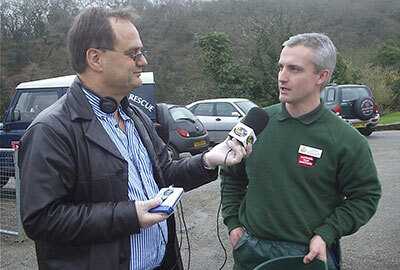 In 2005/06 listeners to popular Cornish radio station Pirate FM Radio 102.2 & 102.8 had voted the Seal Sanctuary the "Cornwall´s Best Tourist Attraction". Pirate FM breakfast radio show presenter, Bob McCreadie presented the award to Dr Glenn Boyle, Sanctuary´s Curator. 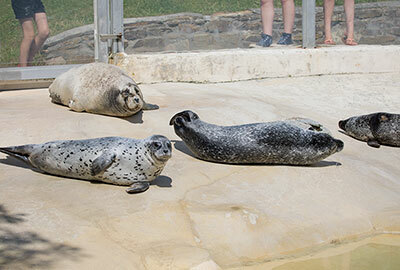 The results were announced by Breakfast presenter Bob McCreadie who had revealed that the Cornish Seal Sanctuary had won by a landslide, in spite of stiff competition from Flambards and the National Maritime Museum. 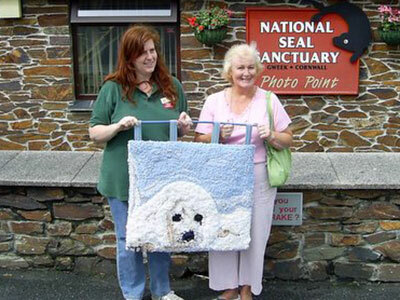 In 2006 a kind hearted lady, pictured below with the Attraction Manager Michelle Drew, Rhona Scott from Swansea in Wales. Rhona spent around 100 hours creating this rug hook art picture of a seal using all recycled materials - shirts, sweaters and other bits of clothing, backed with denim. 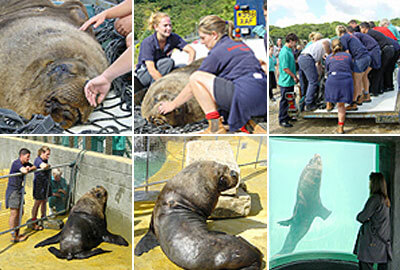 She and her husband Ken visited on 9th July 2006 to donate the fruit of her labours to The Cornish Seal Sanctuary. Rhona said "as the sanctuary was founded by an ex-miner from Tonypandy (Ken Jones), a gift from Swansea was a happy coincidence to keep a Welsh connection going". This is one of our favourite photos from February 2006. 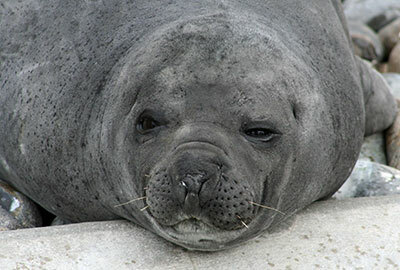 In April 2007 the Seal Sanctuary gave a temporary home to Sahara, a hooded seal, who had washed up off the coast of Morocco in September 2006. He was found in a very poor condition lost and malnourished, and after months of rehabilitation in Tenerife, he was then moved to Gweek for the final stage of rehab before being released back into the wild. Click here to read more. 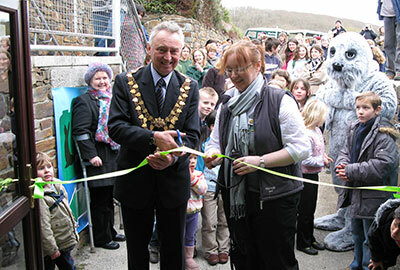 On 20th March 2008 saw the official opening of the combined Seal Rescue Centre and underwater viewing observatory. Opened by the Mayor and Mayoress of Helston this has proved an instant hit with adults and children and the pups and residents were very obliging and performing in front of the viewing windows on a daily basis. 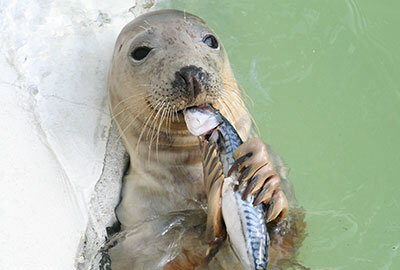 April was only 2-3 days old when she was found on a beach in Padstow on 22nd April 2008 not looking too well. 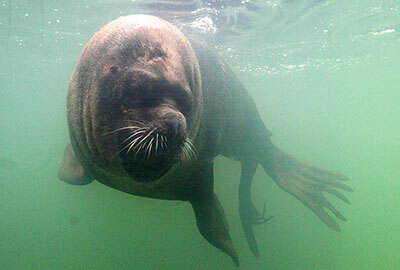 April was released back into the wild at Porthtowan beach on 12th February 2009. 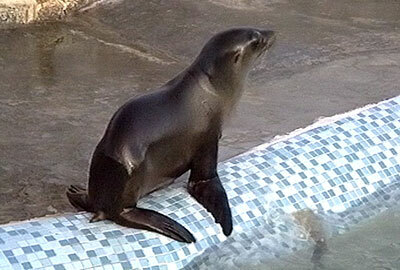 This photo of April was taken a few months later in the nursery pool. 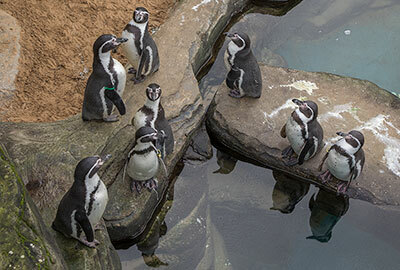 In 2010 the new Penguin enclosure was opened giving six Humboldt Penguins a home. Over the years, the Penguin family would increase as the Sanctuary offers a home to other Penguins in need. Pirate FM 102.2 & 102.8 Radio´s girlband "Eden" carried out the official opening of the Penguin Sanctuary on 1st April 2010, the girls also performed their single "Steal The Night". In 2010 Babyface the eldest adult male harbour/common seal in the world joined the Seal Sanctuary on 17th September 2010, after spending 26 years at Colchester Zoo in Essex. 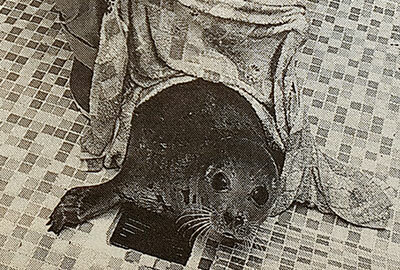 He was originally rescued by the Mablethorpe Seal Sanctuary in Lincolnshire. 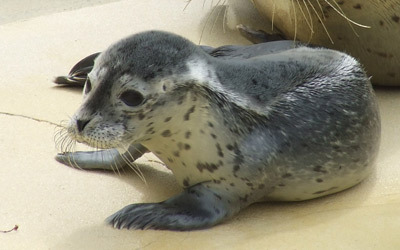 Whilst at Colchester Zoo, Babyface sired many pups. 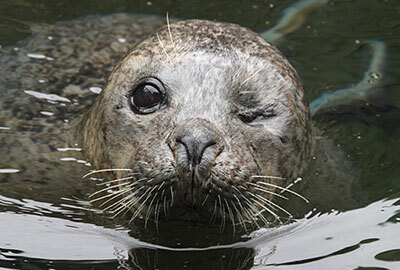 In 2013 Bo (photo below), a common seal, was the first pup to be born in over 15 years. He was a big surprise to the Team as dad, Babyface, was thought to be unable to breed. It was an even bigger surprise when his little brother, Buddy, was born the following year as mum, Sija, was on contraception! Both boys now live with their dad and Jarvis (a rescued common seal pup from 2016) in the common seal pool. In 2014 the Seal Sanctuary had a celebrity helping with the seal release, the BBC One Show´s Mike Dilger came and helped release Rover, Ayla and Jupiter on 2nd June 2014. Click here to watch the release as shown on the BBC One Show. Mike is seen here with some of the Sanctuary Staff. From L - R: Wayne, Mike, Tamara, Jess, Kate and Dan. 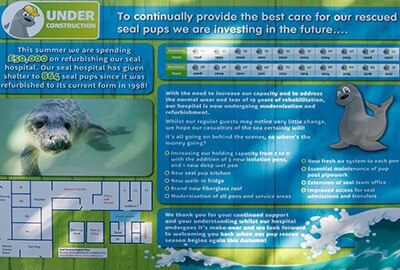 In Summer 2017, the Sanctuary carried out a refurbishment to improve and upgrade the seal rescue hospital. The process took three months and the team were delighted to launch the hospital and be able to showcase the improvements. Click here to read more. 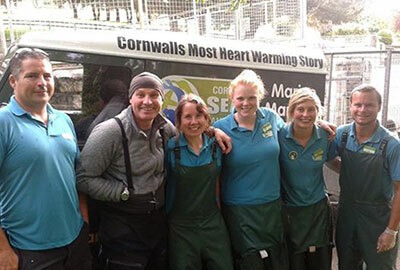 In March 2018 the Cornish Seal Sanctuary has announced it is under new ownership. It now belongs to a charity. Click on an image below to watch some videos from our archives.